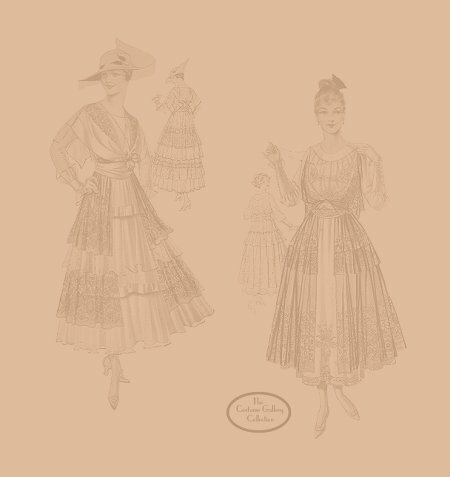 Ladies high-fashion dresses from the "Illustrations of Model Gowns Catalog," Spring 1916 issue, for the Harry Angelo Company located in New York City & Paris, France. The business was contracted to take orders for the designers. Below are 42 ladies' dresses representing 14 fashion designers that were available for this season during World War I. Each illustration shows front and back views of the dress. You may click on each fashion designers name and view each designers history for free. Subscribers may click on each thumbnail image below to VIEW their enlargement and description. IF you are interested in obtaining a subscription for The Costume Gallery Reference Library please click HERE. For group subscriptions please email for price quotes. "Illustrations of Model Gowns, Harry Angelo Company," New York & Paris, Spring 1916. Disclaimer: These articles are being presented as an educational resource of fashions during this era. The Costume Gallery, or its owner, Penny E. Dunlap Ladnier, does NOT sell or make sewing patterns. This publication's text is in its original format. Spelling or grammar may not appear to be correct, but were standard for the original publication date.